Get Your Bovada Poker Bonus of $1,000! Bovada.lv is the recently launched brand by the Morris Mohawk Gaming Group, also know for their popular website – Bodog.eu. Bodog is moving away from the touchy USA demographic, but Bovada.lv is stepping in and eagerly accepting US customers. In addition to Bovada Poker, The Bovada website offers all the sports betting opportunities available across all major sporting events in the US market as well as a full Vegas-style casino with both web-based and downloadable games. Bovada.lv has its license with the Kahnawake Gaming Commission, located in the Mohawk Territory of Kahnawake, Canada. Bovada Poker has many valuable promotions for the new member. The first being the 100% welcome bonus for up to $1,000. The Bovada Poker bonus is paid out in increments and triggered once a certain threshold of poker points are reached. Poker points are, of course, earned by playing real money ring games and tournaments and SnG’s. For every 5 poker points earned, you earn a $1 in bonus money. And you can use up to 60 days to cash in as much of the bonus as possible. It is entirely feasible to collect the entire $1,000 in free money. First, you have to deposit $1,000 and that amount will get matched as the potential bonus you can receive. For the tourney player, the poker bonus represents a 5:3 or 1.67:1 ratio of tournament fees to bonus dollars. As an example, pay $5 in tournament fees (thus earning 15 points) and achieve $3 in bonus money (5 points reward $1). This is a fantastic fee to bonus ratio, and is the best we have ever seen among the internet poker sites. Party Poker, PokerStars, and even Bodog Poker have a tournament fee to bonus ratio of roughly 3 to 1 so it becomes quite apparent of the great deal you can take advantage from the Bovada Poker new depositor bonus. AND the new player bonus goes up to $1,000 which is also larger than most of the competition’s. 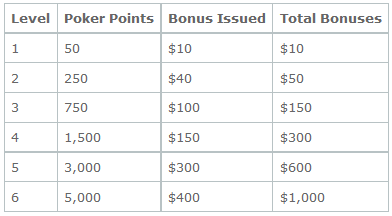 In addition to the new depositor bonus, Bovada Poker has various other strong promotions. As a new Bovada.lv Poker player, you’ll receive invitations to 6 exclusive qualifiers for the Sunday $100,000 Guaranteed tournament. You can take part in $15,000 worth of freerolls every month. You can use your poker points to play in tournaments for real cash! Two $7,500 freerolls occur on the first and last Saturday of each and every month! Bovada also promotes a Royal Flush bonus, Bad Beat Bonus, and a promotion they call “King of the Felt” for Sit & Go players, where if you win 3 SnG’s in a week, you enter a drawing into the King of the Felt tournament and freerolls. If you reside outside of the USA, we recommend considering playing poker at Ladbrokes or PokerStars. Bovada Poker is now closed but the Bovada Casino and Sportsbook are as popular as ever. Find a good review of the Bovada Casino here and here’s a review of Bovada Sports. Or if you like casino games, visit USA Casino Codes for reviews of reputable online casinos available to US players. You may also like trying daily fantasy sports at DraftKings! Click here to read about the DraftKings promo codes available for a special welcome bonus.